1. We send the Gift Certificate to you as a printable PDF file. We CANNOT send certificates by 'snail mail'. 2. Please make sure that we have the recipient's name and the message that you want to appear on the certificate. There is no extra charge for preparing the certificate but we are a two person business and Gift Certificates are quite labour intensive so PLEASE check your wording and spelling before submitting the form. Any changes (other than caused by our error) will incur a service fee of $20. 3. Please make sure that we have a contact phone number for you. 4. We will email a payment request to you with a link to the PayPal website that you can pay with your Visa or MasterCard (you do not have to register with PayPal). We will email the printable PDF file within a few hours of you paying. Please note this is the ONLY way we can take payment via card. Alternatively you can pay by 'Direct Debit'. 5. Certificates are valid until the the end of March 2016. Please print out the instruction sheet to give with the certificate. The recipient can then contact us or book through the website. 6. New dates are added to the schedule as the classes fill. 7. We are very happy to lend the recipient a suitable camera for the course FREE of charge. If you choose PayPal on the order form we will send you a 'payment request' that you can pay with Visa or Mastercard on the PayPal website (you do not have to register with PayPal). 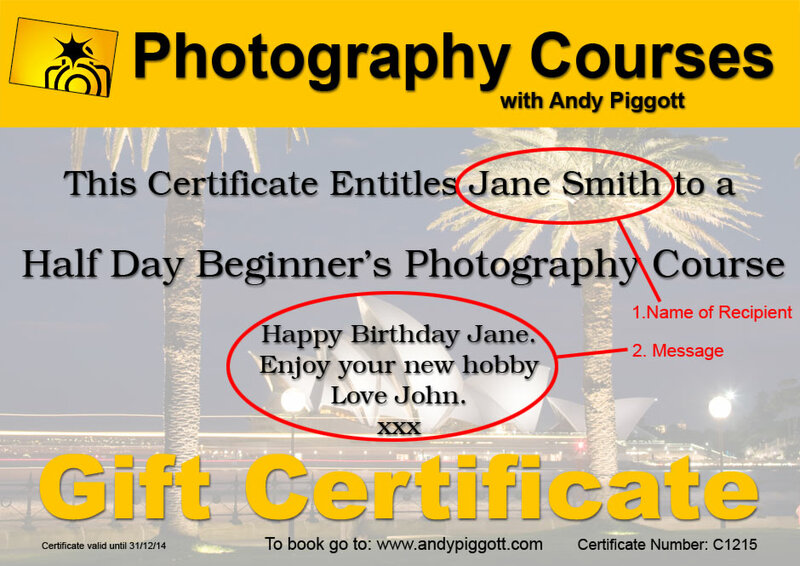 If you are are already registered with PayPal you can use the "Send Money" option and send the value of the certificate to enq@photographyworkshops.com.au (Please make sure you include your name in the comment field). We will email you the printable PDF Gift Certificate when we receive proof of payment (normally within a few hours if order received before 6pm or next day if received after 6pm). All orders for Christmas must be received and paid for by Midday Christmas Eve (24th December).